Hi Marie, welcome to Aside from Writing, can you tell us a little about yourself, how you came to be a blogger and then an author? Thank you so much for having me here today! Over the years, I’ve started several blogs, but none of them really stuck. When I started Ramblings of a Daydreamer, it was mostly a place for me to share my writing—I was writing articles for online magazines and websites—and little bits of my life. I wrote a handful of book reviews for one of the sites I worked for, but didn’t do any reviews on my blog. In April 2011, I joined the A to Z Challenge, which challenged bloggers to write 26 posts during the month of April—one for each letter of the alphabet. I hadn’t really gotten serious about blogging yet, so I knew this was perfect for me—I wrote mainly about writing and books, and the challenge helped me get into the habit of blogging every day. It was while visiting the other participants of the challenge that I discovered the world of book blogging. I don’t have many friends who like to read, so finding all these people who not only loved to read, but loved to talk about books, opened up a whole new world for me. I started writing reviews for my blog, participating in weekly book memes, blog hops, blog tours, and other features. When I realized that the majority of book bloggers I came across read mostly YA books, I was intrigued. I hadn’t read many young adult books since my teens, but I decided to give them a try, and I fell in love. It was then that I decided to turn Blue Sky Days—which I’d written seven years before, and which had been an adult romance—into a young adult book. You’ve recently been working hard on the book launch (January 2012) and blog tour for Blue Sky Days – what were the best bits about going through this process? Hands down, the best part has been connecting with readers. I made quite a few friends and acquaintances in the book blogging community, so I had a lot of people to reach out to when the time came for me to start sending out ARCs of Blue Sky Days, and planning the blog tour. Getting to know fellow bloggers and book lovers has been an incredible experience. Having hosted authors and tours on your own blog in the past, was your recent experience of doing it yourself what you expected it to be? Yes and no. I knew the logistics of it from hosting guest posts, interviews, and giveaways, so I knew there was a lot of work involved, but it was so much more than I thought. 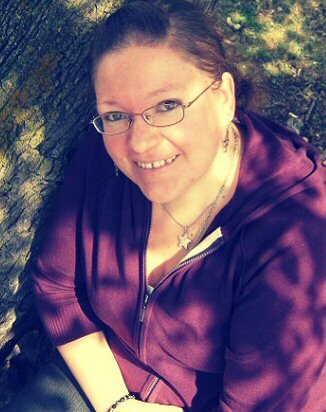 I did everything on my own—a lot of authors find or hire other bloggers to plan their tours, but I planned it all on my own, which meant contacting people, then sending out the books, and scheduling dates, plus then all the interviews, guest posts, and other features I had to write, as well as sending out books to giveaway winners. I also visited every blog along the tour, and spent a lot of time promoting on Facebook and Twitter. Do you think being a blogger has helped you with your creative writing and/or launching Blue Sky Days? And if so, how? Absolutely. 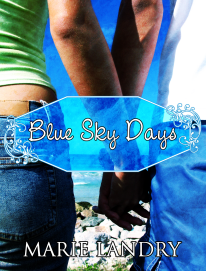 I think that if I hadn’t started out as a blogger, I would have been virtually unknown when I published Blue Sky Days. A lot of authors are unknown when they publish their debuts, but traditionally published authors have a whole team behind them helping to promote the book and take the author from an unknown to a potential star. As for helping me with my creative writing, I think blogging has helped, because it’s gotten me into the habit of writing on a daily basis and keeping those creative juices flowing. What’s an ideal day for you – and how do you fit your writing, reading and blog work into that? An ideal day for me would be one without distractions, but that rarely happens (and that’s often my own fault, because I’m addicted to social media, and check it compulsively). I work from home, and I spend almost all day working on one thing or another. If I’m not writing I’m reading, if I’m not reading I’m blogging, and round and round the cycle goes. Any advice for bloggers who have an interest in creative writing? Write every day, even if it’s just a few sentences. Learn from others—there are thousands of bloggers out there who write about tips, tricks, and their own personal experiences. If writing is something you want to do professionally, build a platform, even if it’s just as a book blogger at first—get your name and face out there so people know who you are. Make connections, make friends, but be genuine about it. Most importantly, keep writing. Don’t let anything or anyone stop you if it’s what you really want to do. Alternatively, do you have any advice for other authors looking to network with bloggers for reviews and support with marketing? Again, be genuine. I think most bloggers are smart enough to know when someone is sucking up to them because they want something, and when someone is genuinely trying to make a connection. One of the best things you can do is be seen, and that’s usually by visiting and commenting on other blogs. Hop around from blog to blog—almost every blog has a blog roll of other bloggers they love, so take time to visit some of them and leave thoughtful comments or join discussions. There are also always a ton of events going on in the blog world—hops, giveaways, read-a-thons. Participate in those, and be visible to bloggers so your name is familiar to them. If you could only do one – the blog or write books – which would it be? Write books. Creative writing has always been my first love, and I think and hope it always will be. I was born to tell stories. So – what else do you have planned for 2012? Right now I’m switching gears from YA to adult, and writing what I guess people would term chick lit, or women’s fiction. I’m a romance junkie, so there’s a romance in the story, but it’s not the main focus of the book like it was with Blue Sky Days. After that, I have ideas for several projects, but I’m not sure which I’ll start next. I might go back to YA and work on an idea I’ve had for several years that involves faeries—but that’s all I’m saying! It would probably be Anne Shirley from Anne of Green Gables. She basically led a simple life, but she had the most vivid imagination that let her live a life that seemed anything but ordinary. She made the best of every situation, and even though she got herself into a lot of trouble with her imagination, she was happy and free-spirited, and a good and loyal friend. Plus, I love Prince Edward Island, where the book was set, and I was totally in love with Gilbert! Hogwarts, without question. It’s my absolute favourite fictional world—the school itself, the people, the magic, getting to go to Diagon Alley and Hogsmeade. I love it all. I’m sticking with Harry Potter and saying Voldemort. He was so evil and cruel, but he was also clever and devious. And not only that, but he represented so much more than just a villain—good versus evil, the power of friendship and love—JK Rowling is an incomparable writing in my opinion. Marie’s debut novel Blue Sky Days is out now! Would you like to know more? Check out the links! This entry was posted in Author Interviews, Blog Interviews, Interviews. Bookmark the permalink. Thank you so much for having me here to talk to you and your readers, it was a pleasure! Great interview Marie – really helpful insight into the publishing/marketing process 🙂 thanks for covering this. As a blogger I completely agree with wanting to meet authors who are interested in what you’re doing as much as what you’re reading.